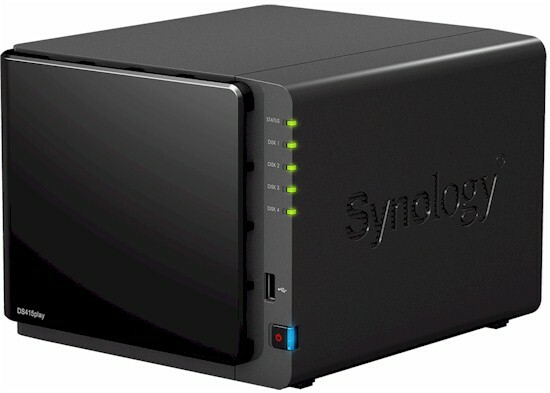 Last month, Synology announced the DiskStation DS415play, a four-bay version of its two-bay DS214play announced last October. The "Play" part of the name connotes that this product is optimized for media. In fact, it is the second DiskStation to support hardware video transcoding to provide 1080p HD video to most media streaming devices. The DS415play is also the first Synology product to come through the SNB lab with Synology's latest DSM 5.0 (DiskStation Manager). DSM 5.0 focuses on "Private Cloud" features as well as expanded capabilities from applications that you can download from Synology's Package Center and run on the NAS. Also included in DSM 5.0, QuickConnect promises hassle free remote access without the need for network configuration and port forwarding. Since DSM 5.0 will be the operating system for all Synology products going forward, I will be doing a separate in-depth look at the upgraded OS shortly. In the meantime, here's the main menu to give you a taste of DSM 5.0. If you can't wait for our DSM 5.0 review, Synology has a live demo that allows you to explore the menus and features. The table below, generated from Synology's website, compares Synology's 4-bay DiskStations. Of all the 4-bay DiskStations, only the DS415play has a hardware transcoding engine. Using the NAS Finder, I selected the DS415play along with two other Evansport-based NASes (the ASUSTOR AS-304T and Thecus N4560) for comparison. All three use the same Intel Atom CE5535 processor running at 1.6 GHz. Both the Synology and the ASUSTOR devices have 1 GB of memory; the Thecus has 2 GB. However, looking at the ranking and the File Copy Write performance, you'll note that the DS415play manages to squeeze a lot more out of the hardware. We'll discuss performance in depth later in the review. Below is a screenshot showing the callouts for the front and rear panels. The front has LED indicators for each disk, a power button and a single USB 2.0 port. The rear panel has a power connector, Gigabit LAN port, a reset button, 2 USB 2.0 and 2 USB 3.0 ports, a security slot and dual fans. There are no inside photos because there wasn't an obvious way to get the plastic outer shell off without the risk of cracking it. The main board is screwed to the drive bay chassis on the right side (facing front of the product). So all we have for internal details is what has already been mentioned, i.e. dual-core 1.6 GHz Intel Atom CE5535 Evansport processor and 1 GB of RAM (DDR3 most likely). Despite their similarities, the DS214play and 415play do not use the same board. The DS214 play has one USB 2.0 and two USB 3.0 ports vs. the 415play's three and two. The 214play also sports an SD card slot and eSATA port that the 415play lacks. Both have a single Gigabit Ethernet port and, in keeping with Synology's current design philosophy, don't have HDMI or VGA ports. We used four 3 TB WD Red (WD30EFRX) drives to test the 415play. Total active power consumption with the drives spun up was 32 W, which dropped to less than 9W with the drives spun down for power save. The power supply is external, which reduces heat inside the case. Although the DS415play has two fans, it wasn't audible in the quiet home office setting of the SNB lab. So we rated its noise level as very low.